A short walk away was the beach and a great photo opportunity. I am sure this image has been photographed many times. The sea was lovely and if you dared to dip your head under the water there was some lovely coral and beautiful marine fish just beyond the buoys which was easily reached even for me. But the reason we were here was to not only enjoy the sun and the sea but we were here with Jamie Malden of Colouricious and Marilyn Pipe to stitch and print to our heart's content. Following are some of the things we made, nothing too strenuous after all we were on holiday but it was lovely to be in such beautiful surroundings and be able to spend some time with new friends trying out new techniques. To be able to spend a week (or even two) sun bathing, swimming, eating and stitching was just bliss after the cold, dark damp weather we had left behind in England. The first day we made a fun book using dyed blanket fabric and woollen threads, a template was provided but we were free to design our own if we wanted. It was quite quick to stitch but we could spend as much or as little time on it as we wanted. The second day was a messy day using glue and paper from old magazines which if I am honest I didn't enjoy. Again it was a book and I used mine to press some of the beautiful flowers we saw growing around the grounds of the hotel. The third day was back to stitching again thank goodness. Marilyn showed us how to do ribbon embroidery on a piece of dyed Silk Noil and I really enjoyed this little project which was designed to be a needle book. One can never have enough needle books. By the fourth day the sun and the relaxed surroundings had got to me so I am not sure exactly what we did. Although I do remember a couple of the staff bringing us in some lovely fruit drinks, we were thoroughly spoiled. I think we finished off what we had been doing earlier in the week and also we made what Marilyn called funky flowers or Lis's flowers because Lis from Denmark had asked her to show her how to make the felted flowers which Marylyn had hanging in her house. I had only ever done felt embellishing on a machine so I found it really interesting to have a go at doing it with the special needle and a small piece of sponge. We were also each given an opportunity to have a go with the clover brush and 5-needle felting tool which made it so quick and easy. By the fifth day if my memory serves me correctly we were back to blanket books but with a more sophisticated air with the addition of organza and beads and buttons, very indulgent. Towards the end of the holiday we were still clamouring for more so Jamie organised some block printing and dyeing, so on with the aprons and rubber gloves and plastic on the tables. On the final morning we had a small exhibition to show the rest of the hotel guests and staff what we had been up to all week as they were all very curious. When I look back over what we made we seemed to have done quite a lot but in reality we only spent an hour or two each morning after breakfast and then another hour or two each afternoon around 3pm. In between times we were swimming, sunbathing or just lounging around reading, napping or walking along the sea shore. Some of us (not mentioning any names) had a massage, pedicure, or manicures and all sorts of treatments which were available as an optional extra. I can personally recommend the pedicure and the purple nail varnish! Whatever next! All in all a wonderful holiday and I can't wait for next year. Maybe I'll see you there. Nope! I don't do New Years Resolutions but I have been doing a lot of tatting and embroidery since the last time I blogged and the new year seems like as good a time as any to bring things up to date, if only to remind myself of what I have been doing. I have a couple of special embroidery projects that I am currently involved in which are set to get more intensive this year. One of which is the Thistle Threads Cabinet of Curiosities on line Casket course and the other is a casket that I am making at workshops conducted with Nicola Jarvis and Lynn Hulse of Ornamental Embroidery. So hopefully over the next few months I shall be updating my blog with info on these and other projects. 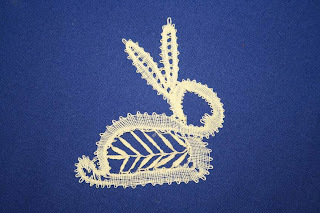 I used to make bobbin lace many years ago and I was looking through some of my old lace photos the other day and came across this cute little bunny I had made for a long forgotten easter. Happy Easter to everyone who celebrates it and Happy Holidays to those who don't. I hope you have an enjoyable break with your families or doing whatever you enjoy doing. in your chosen medium and swap it with a fellow enthusiast. They are swapped between people all over the world. There are whole sites devoted to them as well as yahoo groups but this was a one off we did in the EG forum last summer. It's finished. I enjoyed tatting this motif. Iris designed it so that we could continue making further motifs and turn it into a doiley which I thought was a great idea. With the aid of her computer Sherry turned it into a doiley which is fabulous and makes me want to have a go. Yippee another Tat it and See. This is the 5th TIAS challenge that has been organised by various people but my second time in taking part. This time Iris Niebach aka The Tattingplayer has organised the challenge. We are only given part of the instructions and have no idea what we are making. We have to guess or wait until near the end when we can see for ourselves what it is. No diagrams only instructions. Oh dear, then I have no chance. Fortunately Laura was quick off the mark and provided the much needed picture to enable me to get an idea of what was needed. Inspite of the helpful image I still managed to make a mistake so this was my second attempt. The threads left dangling at the beginning were darned in and look a bit bulky. Not brilliant I must say but it is OK for what I call a sample. I have been running a bit behind as this is the 4th day and I have been trying to catch up. This is the result of the first day's instuctions. Here is the result of the second day's instructions. This went quite well I thought. No disasters. My tension is a bit..well OK... quite a bit off. By this time Jane Eborall and Sherry Pence had also published their versions so it was easy to see I was on the right track. Their versions are much neater but I am still learning these new techniques so I am happy that at least I have understood and been able to follow the pattern. Measuring the picots was a bit of a challenge fortunately I learned the different ways of doing this at a workshop in Portsmouth hosted by the Pompey Tatters who are a really helpful and friendly bunch. This is the result of the day 3 instructions. This is beginning to look interesting. I have still no idea what it could be but it looks pretty in two colours. I made a mistake on the 3rd blue ring and had to cut it out and start that section again. More practice in stitching in ends. I think I am going to have to make this again once I know what it is just to prove to myself I can actually make it without making so many mistakes. Well I have finally caught up, this is the result of the day 4 instructions. This wasn't particularly difficult but I still managed to make a couple of stupid mistakes which were easily rectified as I spotted them before I closed the ring. I also ran out of the pink thread (more practice in darning in threads) and to cap it all I noticed I have done a couple of design modifications by adding an extra picot on each side of the top trefoil(at least I am assuming it's the top). It wasn't intentional so I hope Iris will forgive me. I am now ready for the next set of instructions, hopefully I will be able to finish it without running out of thread again or making any more mistakes. I am quite pleased with it so far despite the mistakes and I have enjoyed the challenge and learning new techniques. My New Year's resolution is to finish all my UFO's by the end of 2009. (Did I hear someone sniggering!?) Knowing how many UFO's I have I don't think it is realistically possible but it is only January. Before Christmas Jon generously offered the pattern for this beautiful celtic snowflake. I managed to do the first two rounds before Christmas and finished and blocked it yesterday. The thread I used was Marilee's Yarnplayer Sugar Maple Linen 30/2 which I purchased back in October. The photo doesn't do it justice as the colours are lovely. I had been looking forward to using this thread but I made the mistake of not making a test motif in cheap thread and had to retro tat a couple of times. I enjoyed making this motif and will definitely make it again. I started Jane E's fabulous Daisy bracelet pattern as soon as she posted it. I had optimistically intended it to be a birthday present for a friend's birthday. I dutifully tatted the earing as a test tat but shortly after starting the bracelet I got myself a bit confused with the pattern so I put it to one side in order to do my Christmassy things. You can see where I have gone wrong but I will continue with it and keep it as an example, as i have plenty of thread and beads. Hopefully by the time I have eventually finished the bracelet I will have the pattern firmly cemented in my brain and will be able to do it again without any mistakes. Oh and by the way my friend ended up with something totally different for her birthday. 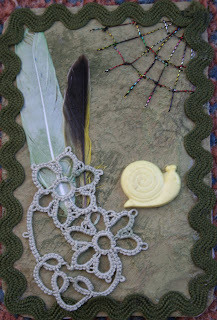 An embroiderer, lacemaker, in fact all crafts interest me it is only my full time job that prevents me from doing more. When I am not sewing you might find me in my garden. Widowed, children grown but still don't seem to have enough time for everything I want to do. Committee member of my local branch of the Embroiderers Guild for several years which also keeps me busy.